Roses in containers must be protected from the winter elements. One benefit of containers is that you have options on where to place them. 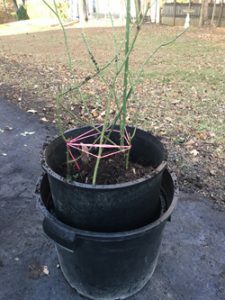 It is best to wait to winterize your container roses until there are two freezes below 28 degrees before you winterize, usually start around the first of December. Before winterizing your roses, check your soil’s pH. Ideal is 6.5. If your soil pH is below 6, you can increase the number by adding lime. If you have a 12 to 15 gallon container, you can work one cup of lime into the soil. You should adjust the amount of lime you add based on the size of the container you have. Add one to two cups of Mills Mix to the soil in each 12 to 15 gallon container. Again, adjust the amount of Mills Mix based on the size of the container. Consider the placement of your bushes. Is there a better location for them in your yard? Remember that wind is more likely to damage your roses than freezing temperatures. One of the advantages of having your roses in containers is the opportunity to more easily change their location. Prune your roses and be sure to remove all the leaves. Seal all of the cut canes with Elmer’s Glue. Clean all debris from the soil. Tie up the canes so that they fit well inside of the container. 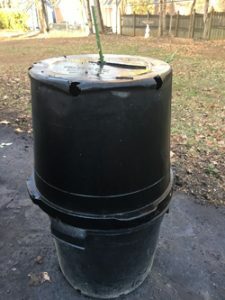 Cut the bottom out of another container about the same size and put it over the bush. 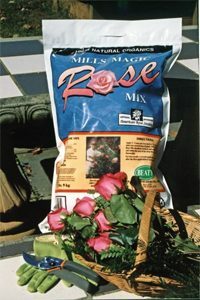 Pour the same soil mix as the rose is planted in into the top container to cover the bush. Your container roses should be well protected to survive the winter and to be healthy and provide beautiful blooms in the spring. 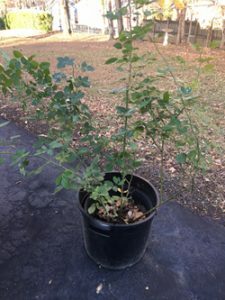 When a rose bush has been grown in a container for as long as 7 to 10 years and it is worth keeping, it’s time to carefully repot it. Keep the root system as intact as possible. You can reuse the container but plant the bush with all new soil mix. This process will reboot the life of the bush.